The Nissan Leaf is the best-selling vehicle in Norway in 2018. Consult 62 years of Norwegian Historical Data here. In 2018 Norway has confirmed its status as the world leader in green vehicle sales, reaching a world-record 60.2% share of it market thanks to deliveries up 7.6% to 89.012 units. This is to be compared with 52.2% share in 2017, 40.2% in 2016 and just 7% in 2012. Norway has vowed to bring sales of new fossil-fuelled vehicles to a stop by 2025, a target that will only be achieved if one issue is solved: that of the overnight charging of electric vehicles whose owners don’t have a private parking spot. In the detail, sales of zero emission EVs have historically surpassed all other fuel types in 2018, sup 39.5% to 46.143 and 31.2% share vs. 20.9% in 2017. In contrast hybrid sales are down 13.8% to 42.869 and 29% share vs. 31.3% last year. These include 26.546 PHEV, down 9.2% year-on-year. 51 new hydrogen cars were registered in 2018 (-7.3%). Gasoline cars are down from 24.7% to 22% share this year and diesel sales are down from 23.1% to 17.7% share. Also of note is the dominance of fleet sales at 54.1% overall share vs. 52.3% in 2017. Private leasing is included in this future. 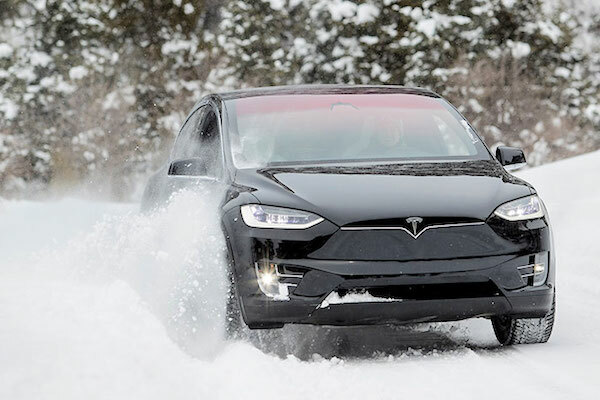 Tesla held a record 19% of the Norwegian market in September. The overall Norwegian market is down 6.8% to 147.929 units and the two best-selling carmakers are falling twice as fast: Volkswagen (-13.5%) and Toyota (-18.2%) both lose at least one percentage point of market share vs. 2017. But Nissan (+123.3%), fantastically lifted by the new generation Leaf, more than doubles its 2017 sales and gains 7 spots to land on the third step of the podium, knocking BMW (-6%) and Volvo (-3.2%) down one spot to #4 and #5 respectively. American EV maker Tesla (+1.8%) manages to improve its volume to over 8.600 despite the mass-market Model 3 not having landed yet, breaking its all time record monthly share in September when it ranked #1 brand overall in Norway with a staggering 19% of the market. Jaguar (+354.8%) posts one of the largest gain in market thanks to the arrival of the i-Pace EV, ranking #5 in October. Chevrolet (+1650%), Seat (+1061.5%), Dacia (+139.1%), Jeep (+106.3%), Alfa Romeo (+58.9%), Hyundai (+30.2%) and Renault (+14.3%) also impress. 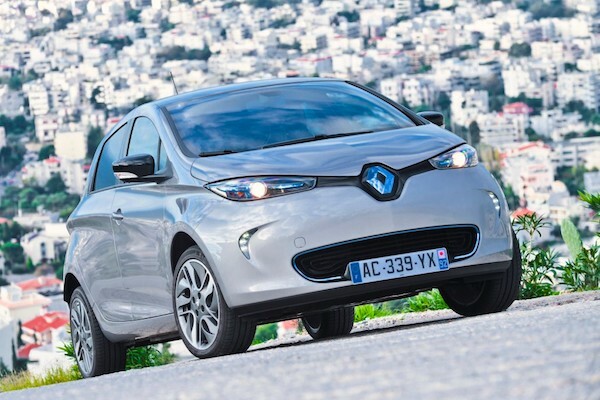 The Renault Zoe scores its first ever annual Top 10 in Norway – and the world. 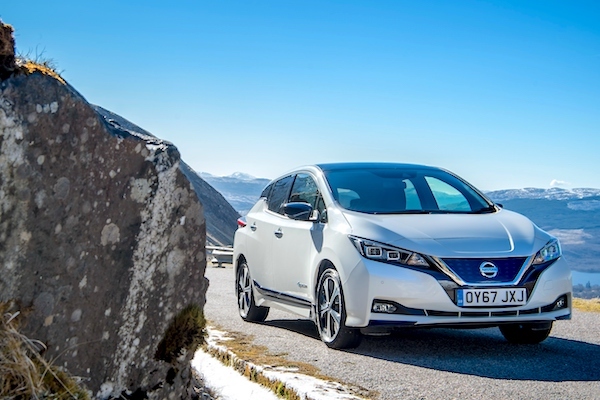 The Nissan Leaf (+264.6%) spectacularly snaps the annual Norwegian pole position thanks to its new generation, frankly outselling the leader of the past decade, the VW Golf (-18.9%). This is to BSCB’s knowledge the first time the Nissan Leaf is the annual best-seller in any country in the world. The BMW i3 (+12.9%), Tesla Model X (+4.9%) and Mitsubishi Outlander (+1.1%) all improve their volume year-on-year to round up the Top 5. Other great performers in the Top 20 include the the Volvo XC60 (+49%), Hyundai Ioniq (+25.3%) and Renault Zoe (+24%), the latter breaking into the annual Top 10 of its first market in the world. Full Year 2018 Top 53 All-brands and Top 20 models vs. Full Year 2017 figures below. Full December 2018 Top 40 All-brands and Top 15 models below.